Audi Mechanicsburg offers you the complete luxury performance experience. We offer the full Audi line, including the peerless Audi R8 Spyder, the Audi RS models, the Audi A4 Allroad, the Audi SQ5 SUV, the Audi Q7, and more. If you're ready to take off out of York, PA in an Audi RS 5 or tour through the townships to Hanover, PA in an Audi S5 coupe, Audi Mechanicsburg is your destination. All Audi models come standard with incredible German-engineered quality, thrilling performance, and purely impeccable styling. When you're behind the wheel of an Audi, you'll find pioneering autonomous driving technology, an exquisitely crafted interior, luxurious comfort, rich entertainment, and of course, breathtaking road performance. When you roll through Harrisburg and Hershey in a brand-new Audi performance luxury vehicle, you'll make an unforgettable statement. Prefer your luxury motors to come broken-in for you? We maintain a full collection of previously owned Audi vehicles and other luxury vehicles for you to sample. Our Certified Pre-Owned Audi collection features many top Audi models, like the Audi A4 and the Audi Q7. Many of these Certified Pre-Owned Audi models are under a year old and have fewer than 10,000 miles on the odometer--and they feature an excellent Audi warranty and Audi support services, just as brand-new Audi vehicles include. Looking to research some other brand options? Our additional pre-owned luxury model inventory includes popular high-end vehicles like the Porsche Macan, the Land Rover Range Rover, and the Cadillac ATS. There is so much to choose from that you're certain to find the luxury experience for you. When your premium Audi model is due for regular service, our Audi Service Center is the premier location to take care of it. Our specialized Audi technicians are experts in everything Audi. Our Audi Service Center is state-of-the-art, excellently equipped, and kept well-organized and spotlessly clean. We roll out the red carpet for you and your Audi with every service, whether it's an oil change or an overhaul. The Audi Mechanicsburg Parts Center offers a complete selection of genuine Audi accessories and components for you to browse, and our knowledgeable staff can help you find virtually anything you could need for your Audi. Looking for something particular? Our parts experts can order it for you. Get your Audi adventure started with quality Audi leasing and financing services. We offer a multitude of new Audi lease options, new Audi loan selections, pre-owned luxury car financing features, and more. Our finance professionals will assist you in securing the right luxury financing choices for your style. Our experts can calculate your trade-in vehicle's fair value as well. To ensure accurate and up-to-date values, we research current market demand, supply, and trends for similar models, both locally and across the nation. If you're ready to get started, take the first step instantly--apply online for your new Audi financing. Our online Finance Center features a secure financing application, a payment estimator tool, a wealth of incentive and pricing information, and other valuable car financing resources. Thinking about that new Audi? Don't hold yourself back from the thrilling automotive experience you deserve. Visit us for a test-drive today in Mechanicsburg, PA. Once you get behind the wheel of a new Audi and experience excellence, you'll never look back. Audi Mechanicsburg is always ready to help you expand your automotive experience with new Audi vehicles, pre-owned luxury models, refined financing solutions, and expert Audi automotive maintenance services. 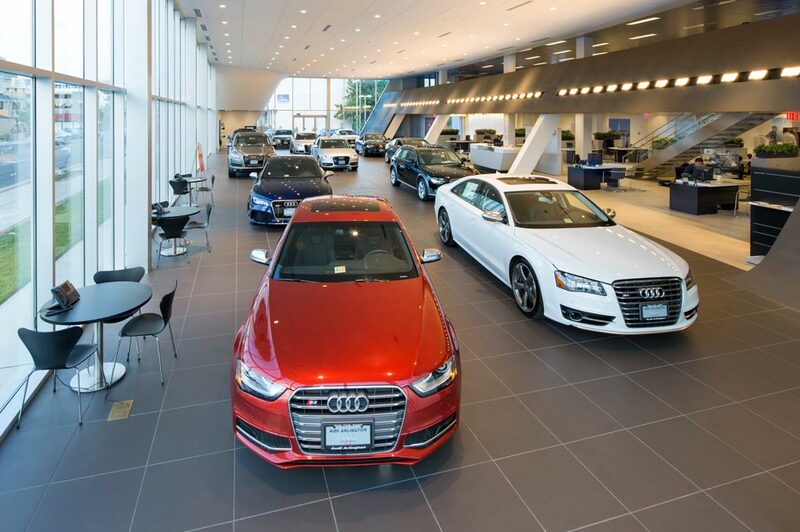 Audi Mechanicsburg in Mechanicsburg, PA treats the needs of each individual customer with paramount concern. We know that you have high expectations, and as a car dealer we enjoy the challenge of meeting and exceeding those standards each and every time. Allow us to demonstrate our commitment to excellence! Our experienced sales staff is eager to share its knowledge and enthusiasm with you. We encourage you to browse our online inventory, schedule a test drive and investigate financing options. You can also request more information about a vehicle using our online form or by calling 717-691-3333.